81⁄2 x 11 - 336 pages. 843 illustrations and photographs. With Sessions Clocks, Tran Duy Ly’s monumental task of documenting the production and history of the eight giants of the Connecticut clock industry is now complete. Starting with Seth Thomas Clocks and Movements, over 15 years ago, and finishing with the last of the major Connecticut firms, Sessions, Mr. Ly's series on Connecticut clock manufacturers is the unequaled reference on the history of the clockmaking industry in America. The significance and usefulness of Tran Duy Ly’s books became very apparent to me shortly after I assumed the responsibility for the Library and Research Center at the National Watch and Clock Museum at the NAWCC Headquarters in Columbia, Pennsylvania. My duties include answering member’s research questions about their clocks and watches. Many questions pertain to clocks from companies such as Seth Thomas, Waterbury, Welch, Ansonia, New Haven, Ingraham, Gilbert and Sessions. Thanks to the comprehensive identification guides in Tran Duy Ly’s series, research can be done quickly and efficiently. Sessions Clocks is a concise reference for this 20th century clock company and its products. By first educating the reader with his section on “Important Tips”, Mr. Ly establishes a well organized and logical pattern to his book. “Important Tips” is an invaluable review of the “need to know” details that are necessary for collecting and evaluating clocks. The history of the Sessions Clock Company, provided by Chris Bailey, provides a well-written synopsis of the company from its early roots until today. Production totals by year and model are included as well as actual photographs of the Sessions factory. Collectors often ask for information about their clock and the company that manufactured it. The inclusion of this well-written history will be a valuable resource. 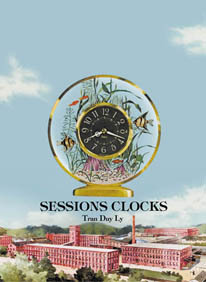 The main text of Sessions Clocks is a comprehensive collection of the clocks produced by the Sessions company. Tran Duy Ly has organized the various types of clocks into distinctive sections, to include; alarm clocks, automobile clocks, banjo clocks, calendar clocks, hanging clocks, leather cases, longcase clocks, a variety of mantel clocks by case type, mission clocks, novelty clocks, and side pieces. The illustrations are clear and in a trade catalog format with a written description of the clock along with the date of production. An important aspect of this book is the inclusion of illustrations of the electric clocks that are available in each category. These illustrations include detailed diagrams of the electric movements along with other technical details that will be a tremendous help to repairers as well as being informative to the collector. Tran Duy Ly has done an excellent job in presenting the Sessions Clock Company and its clocks. In addition to all of the fabulous information, the inclusion of his up-to-date price guide makes Session Clocks a must for any collector or clock enthusiast. I am pleased to introduce Tran Duy Ly’s Sessions Clocks to the collecting world. I am sure it will be a strong reference for years to come.